Last night Hans Keifer, Steve Messer and Jim Hasenauer attended the public comment meeting put on by the National Park Service in Santa Clarita. The following is a summary of the presentation and our thoughts, concerns and feedback on the study. This study was mandated by Congress through a bill introduced by Hilda Solis back in about 2002 and passed in 2003. The study began in 2005, but this is the first much of the public has heard of the process, including me and other CORBA and IMBA volunteers. The study area includes much of the San Gabriel mountains, as well as the San Gabriel Watershed. The watershed includes the San Gabriel River drainage area within the national forest, as well as cities along the river and its watershed such as El Monte, Hacienda Heights, La Habra, Brea, Walnut, West Covina, Baldwin Park, Monrovia, La Verne, and the Puente-Chino Hills area. See more on the study and the process. 1. the "Significance" in biological, historical and recreational terms, of the study area. 2. the "Suitability" of the area for inclusion in the National Park system. That's to say that it fills a gap in the National Park system that can't be filled by anything else... ie. its uniqueness. 3. The "Feasibility" of bringing it into the National Park system in some manner. So far the study has found that there is Significance worthy of national park protection. The mountains, the biodiversity, the unique geological character, architecture and history all make it significant. There is "Suitability" in that there is nothing else quite like it already within the National Park System. It was deemed to be infeasible to make any of the study area a National Park. There are too many land owners and land managers, too many private holdings even within the National Forest, and in many respects, would be re-inventing the wheel to start from scratch with what the Forest service has already accomplished in managing the forest. However, it would be feasible for the National Parks service to come in and participate in the management and development of the area, in collaboration with the Forest Service and other land managers in the study area. Of particular concern to us, as mountain bikers, is the continued access to the trails to which we have access, the possibility of new trails being built, and to avoid any further wilderness designations. The final goal of the study is to present to congress a report on the Significance, Suitability and Feasibility of the area, and make a final recommendation as to the most effective and efficient way for the NPS to be involved in the management of the San Gabriel Mountains and San Gabriel River watershed. What is not covered at this stage of the study is what happens after the study is complete. Once the final recommendation is made, it would then be up to congress to decide what to do with the recommendation. Of particular note is that Hilda Solis is now Labor Secretary, and is no longer involved in the committee that would be receiving the results of the study she helped start. The recommendation may linger on a shelf and never be implemented, or it may get picked up, brought to committee, a further recommendation made to the full house, and then may or may not pass. This introduces some concerns. Alternative A and Alternative C both have the largest federal presence, and both would require an act of Congress to implement. Whenever an act of congress is proposed, it will be debated and most likely amended. Amendments may introduce language to weaken our position as mountain bikers, to introduce more wilderness legislation, or to to pander to certain special interest groups with large lobbying powers. It opens the door for a whole range of uncertainties in the implementation of the plan. But that scenario would be a long way off. The study is still (four years along) at a very preliminary stage. They expect to have the draft proposal ready in a year, another round of public meetings and comments, and present their findings to congress in 2011. Several times during the presentation and the Q&A group sessions, it was expressed that the NPS would continue to allow the Forest Service to manage the forest, and other land managers would continue to manage their own jurisdictions. From our point of view as mountain bikers, this seems good policy, since the Forest Service has just spent five years or so developing the Forest Management Plan <http://www.fs.fed.us/r5/angeles/projects/ForestPlan.shtml> in which the most productive use of the forest was deemed to be Recreation. It sounded like the Forest Service would be able to continue to implement that plan, which is not at odds with the concept of a "National Recreation Area." Jim, Hans, and myself split up and each joined a different discussion group. Nowhere was there any strong or vocal anti-mountain bike sentiment, and in Jim's group four of the fifteen people were mountain bikers. My group were all hikers from Santa Clarita who wanted more trails and access from the northern slopes of the San Gabriels, which are greatly under-utilized in comparison to the more populated southern slopes. There was no equestrian presence, but a few in my group said that the equestrians were supportive and would be doing a letter writing campaign. Given the past positions of the Equestrian Trails, Inc. (ETI), their campaign will likely be very anti-mountain bike. But this meeting wasn't really about what people wanted more or less of (trails, signage, interpretive centers, etc) though that is what came up most in the group discussions. It was about how the forest and watershed would be managed, and the alternate proposals for how that partnership would function. Management includes the ability to meet the needs and provide the resources that the public want, something that just isn't presently happening given the current financial situation of the FS. 85% of their budget presently goes to fire management (well spent at the moment) leaving little for improvements. Alternative A, the forest would get the largest involvement by the NPS, the largest land area that would be covered (most of the Lower Angeles National Forest) and management would come mostly from the National Forest Service with assistance, input, and funding from the NPS. This seems to us, as the better option, with less agencies involved, more land area, and more funding. It incorporates most of the Southern Angeles National Forest, and little outside the forest. 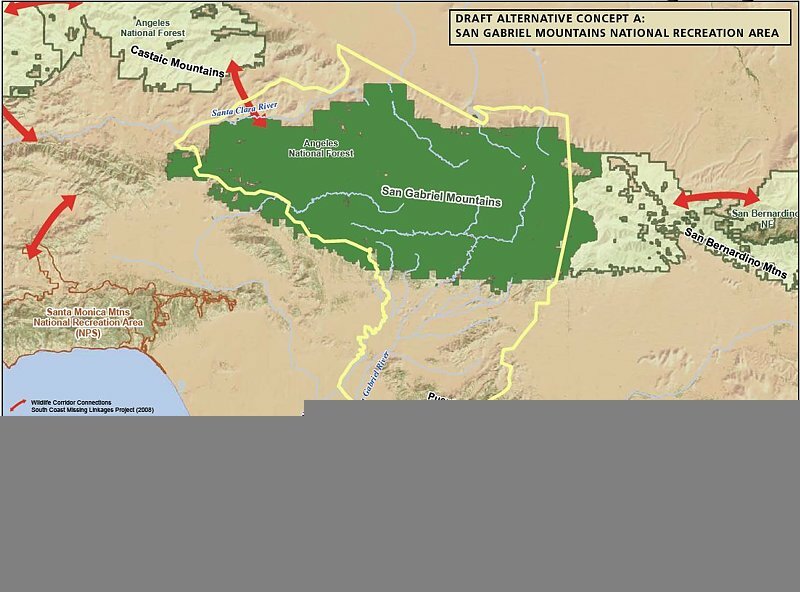 Alternative B would have the NPS creating a Master Plan for the whole area, San Gabriel mountains, rivers, all of the cities and land managers along the river and into the Chino hills. After that master plan is developed, the NPS would have little involvement, and it would be up to each individual jurisdiction to implement that master plan as a the San Gabriels Parks and Open Space Network. It includes the southern Slopes and the San Gabriel mountains and the river corridors. Alternative C would have the NPS taking a leadership role and overseeing a partnership between the FS and the many local land managers. The area would include only the San Gabriel watershed and river corridor. This would exclude most of the current southern Angeles National forest. There was no mention of new wilderness areas, as this is strictly a study for inclusion in a National recreation area, or Recreational Open Space area, not a wilderness study. Not much was addressed among the group discussions about the lower watershed, including the various cities and the Chino-Puente hills area, though the meetings in El Monte and Diamond bar would have had more involvement in those areas. There is a comment period on the current presentation through October 30th. At the above web site, click on "Newsletter 4" then click on the "Comment on Document" link on the left side of the screen. 1. Is there one alternative concept or idea presented that you think is most valuable in terms of improving recreational opportunities and protecting significant resources? Tell us why you think this idea is valuable. The inclusion of the largest land area, Alternative A, would give the most coverage and likely bring the most resources in to manage the national forest. A combination of Alternatives A & C would provide the most coverage of important natural resources, including both mountain and river protections and opportunities for interpretation. A combination of A & C would create a strong federal management partnership between the USFS and NPS and a strong recreational identity for the San Gabriel Mountains and watershed. 2. What suggestion do you have for strengthening or improving on the alternative concepts? Do you have an entirely different vision of how the area should be managed? If so, please describe your vision. However, the inclusion of the lower watershed portions of Alternatives B and C, which incorporates much of the green belts along the rivers and the Chino-Puente hills, would present the most recreational opportunities to the largest number people. 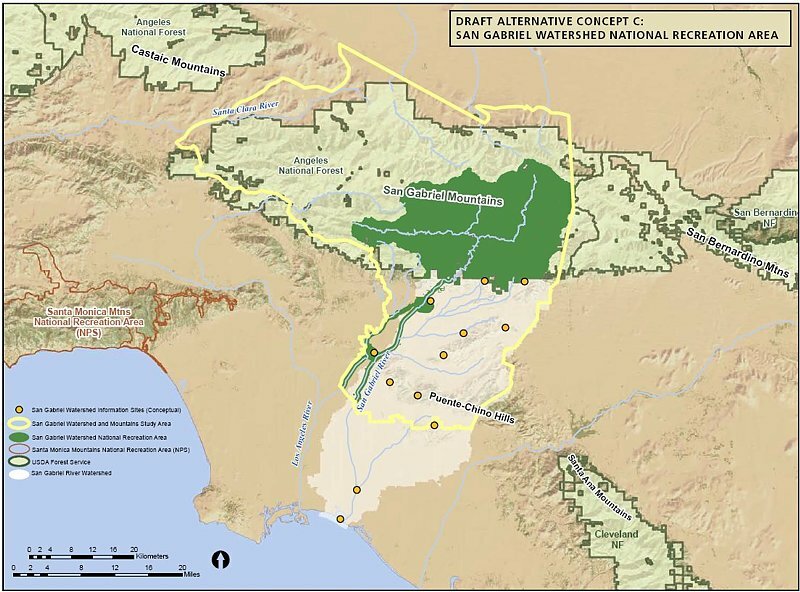 Perhaps some hybrid of these proposals in which the NPS and USFS manage the San Gabriel Mountains portion, and together oversee the partnership outlined in Alternative C as an open space network. 3. What concerns do you have about the current alternatives? Recreation. The most productive use of the forest should continue to be recreation, as outlined in the current Forest Plan, and recreational access should be increased through a more streamlined process for getting new recreational projects approved. Recreational projects should be given administrative and considerational priority over commercial and other proposals, since the most productive and valuable use of the forest has been deemed recreational. We would hope that the NPS could bring in additional staff to more rapidly complete studies required by the NEPA process. These goals would seem to be in line with a National "Recreation" area. Mountain bike access. There is a strong need for an area for mountain bike specific trails for this fast growing user group, both to take pressure off existing multi-use trails and minimize disparate user group conflicts. However, this should not be at the expense of continued access to the existing trail network, which are currently enjoyed by many thousands of mountain bikers annually with few conflicts. A mountain-bike specific area or trail network would serve a subset of the mountain bike community whose major preference is technical downhill riding, and whose need has been demonstrated by the continued construction of illegal trails that meet that need within the region. This would remain under Forest Service management within the proposal, and no NPS policy should preclude the fulfilling of this recognized need. Protection. Wilderness designations should be actively discouraged from any recommendation, legislation or amendments to legislation, as such designations do not meet the requirements for the best recreational use or protection of wild areas. Other protections are available that allow better management and access to wild areas without compromising biological protection. Other political and user groups are seeing this study and proposal as a way to slip in more wilderness designations. This is contrary to the recreational nature of the forest and not in the best interest of the public as a whole. Management. The Forest Service should be allowed to continue to implement its Forest Master Plan, albeit with additional resources and funding provided by the NPS within their shared goals and objectives. They have already invested years of study into the area, and have developed a master plan that at present provides the best guideline for the management and further development of the forest. 4. What are your thoughts or comments on the study findings (significance, suitability or feasibility)? There is no doubt among any who have hiked, mountain biked, soared (hang gliders), ridden horses, off-highway vehicles, rock climbed, or done any geological, biological or archaeological study, that the area is significant, unique, and worthy of including in the NPS system. The biggest concern then becomes the addition of an additional layer of bureaucracy when trying to make improvements in access, recreational opportunities or facilities. Based on information in the presentation, those concerns appear to be minimized in the present proposals. The political manipulation of legislation that may be introduced as a result of the study favoring one user group over another, or one type of biological protection over another, then becomes the major future consideration, and that is largely beyond the scope of the present study. There is nothing presently in the study that would threaten mountain bike access to the Naitonal Forest. In fact, all indications are that the increased funding and NPS administrative assistance, as Alternatives A and C would provide, would be beneficial to all forest user groups. Perhaps some hybrid of the alternatives would be best. The NPS will hopefully determine that from the comments and meetings. At present, we should keep monitoring the web site <http://www.nps.gov/pwro/sangabriel> for changes and updates. The newsletters (Currently number 4) outline the progress of the study and explain each of the currently proposed alternatives in detail, including the vision, concept, management structure and funding. Post your comments to the NPS web site as mentioned previously, and feel free to use what has been provided above or to elaborate or put your own thoughts into words. The next round of public meetings will take place once the draft proposal is ready (Q4 2010), and we'll have the opportunity to make our voices heard again then.